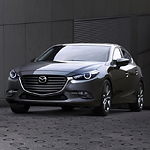 The Mazda3 has some of the latest safety features to compliment the latest technologies on board as well. You can listen to the radio if you like, or you can use your Bluetooth activated device to get your own music, news, podcasts, sports scores, and more. While driving around with all of those amazing features don't forget that this vehicle is keeping you safe. It has steering assist and other safety features that help to keep you safely on the road at all times. It helps to make you a better driver and may even help you to reduce the amount that you have to pay in car insurance as a result.